Why is college tuition so freaking high? It's been pretty widely publicized that the average amount of student loan debt is edging closer and closer to $30,000. Personally, I had $40,000 and have talked to plenty of people that have SIGNIFICANTLY more (think $100,000+)! Student loans are quickly becoming a financial epidemic in this country, and while the inflation of college costs has slowed, there seems to be no true end in sight to the rising of tuition prices. Now, I want to be as objective about this as I can be when looking at college costs and how they impact student loan balances (I hate student loans, so this is hard). I was born in 1988, which is right in the middle of the time range that qualifies you for the “Millennial” generation. 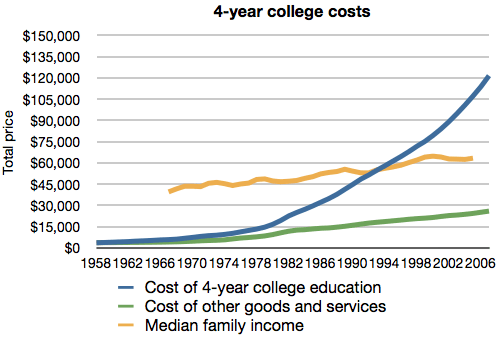 From 1988 to 2008, college tuition prices rose 130%. There a ton of perfectly reasonable factors that contribute to tuition rates rising so dramatically such as: inflation, increased enrollment rates, need for additional staff, modern learning facilities, and updated technology infrastructures. However, there are some price issues caused by universities that I think should be looked at with a bit more scrutiny. I'm not going out on a limb and saying colleges are evil and greedy by any stretch, but some of the numbers I'm going to share below are pretty eye-popping. As always, feel free to debate with me in the comments if you disagree with anything presented in this post and I'll hear you out. All the sources for statistics are cited at the bottom of the post. 1) College administrator salaries have risen…big time. From 1978 -2014, the amount of administration level jobs at universities increased by 369 percent, which outpaced non-tenure track full-time and part-time positions respectively at 259 and 286 percent. Tenure track positions rose just 19 percent over the same time period. From 2000-2010, median administration salaries rose 39 percent. There could be a range of reasons for this, but much like the government or large corporations, there is probably a fair amount of bureaucracy excess at the top level of public and private universities. 2) College President salaries are also up. Public university Presidents' salaries rose 75 percent from 2000-2010. In the same time period, private university Presidents saw a whopping 171 percent salary increase. According to The Huffington Post, 42 private college Presidents make over $1,000,000 dollars per year, with the median being just over $400,000. University of Chicago President Robert J. Zimmer earns $3,358,723 per year. CNN Money states that public university Presidents' salaries are $428,000 on average, with the highest being former Pennsylvania State President Rodney Erickson at $1,494,603. Again..I'm trying my hardest to be objective, but considering the amount of young people that have to take out crippling sums of student loans and are struggling right now, those salary numbers are a bit unnerving. For the sake of the length of this article, I won't even go into college football coach salaries. University of Alabama head football coach Nick Saban will make 7.3 million dollars in 2015. 3) Athletic Programs cost a lot of money (and actually cause many schools to lose money). This one was brought to my attention a few days ago when I came across the below video from Upworthy.com. I LOVE college football and basketball, so the financial reality of college athletics was a tough pill for me to swallow. If you've haven't been to a college campus lately, they are pretty freaking sweet now. Colleges are ultra-competitive for a student's enrollment, and resort-like amenities are now common in the college arms race. For example, my college had a megalith recreation center that was complete with a massive rock climbing wall and a lazy river. Seriously. There were several large dining facilities, 3 university centers, ballin landscaping, and even an arcade room. A lot of parents and students may think that this stuff is cool and necessary for a decent quality of life while in school, but from my point of view – college living is too nice and actually better in many respects than the real world. I don't have a gym membership, a 24-hour arcade, or a sweet university center to hang out with my friends in anymore. In the real world, those things aren't included in your salary. Many of the amenities above are pre-packaged into tuition now as unavoidable fees…which eventually turn into student loans. Just food for thought. Again, this all just scratches the surface on what drives the student loan crisis. I would need to write an entire book to cover the intricacies of college tuition costs over the past three decades, and we haven't even talked about living costs or irresponsible/unfortunate borrowing and lending habits. However, I do think that the upper level administrator salaries and athletic budgets are not in line with keeping college in America affordable. Did I miss anything? Should college administrators and football coaches be paid in excess of 1 million dollars per year? 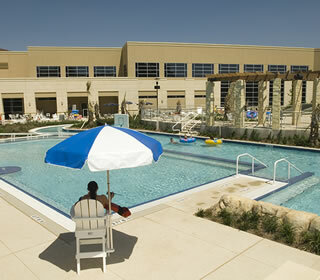 Are college amenities over the top? Let me know and I'll politely argue with you below. Featured picture by DonkeyHotey and lovingly edited by M$M! Those are some pretty infuriating statistics! I knew college administrators and presidents were overpaid, but wow…I didn’t expect any of them to be making millions of dollars per year. That’s crazy – especially for public colleges. I thought they made $200,000ish…I had NO idea these guys were getting RICH while students are struggling. It’s disappointing how universities and hospitals are run more like for-profit corporations now than the “non-profits” that they are supposed to be. I think a couple additional contributors to higher tuitions could be (1) “market pricing” of education as it’s run like a for-profit corporation (i.e., tuition rises as high as the market can bear…think of things like sports or Disneyland tickets, where capacity is limited and prices will keep rising as long as people continue to pay), and (2) easy financing…this affects students being “able” to pay for college. Prices tend to go up for things that are easy to get financing for, since there’s increased demand (think the mortgage crisis, 7-year car loans, etc). BTW, I think market pricing affects hospitals too, which is one reason why you see healthcare getting so expensive. Plus these phenomenon are mostly US phenomenon…you don’t see these drastic rises in other developed countries. I agree – very disappointing. As long as students are able to borrow large sums of money, the colleges will continue to raise tuition prices. My gut feeling is that at some point the system will become unsustainable (think housing crisis) and implode. Man, what a sweet gig! I should have been a university president! (Didn’t even remember that they made a change). I think each of these is a contributing factor, but I think one of the biggest factors is that demand is way up. Gen Y is bigger than Gen X, and more of us went to school. I think that in the next few years as demand finally levels out, we’ will see education costs fall more in line with typical inflation (though I don’t think it will fall in real terms unless student loan debt is no longer federally backed). Too bad about those athletic programs though. I ran in college, and it helped pay my way. I can’t guess that women’s xc was a big revenue driver for my school. I think you’re right, and that is an interesting take with demand leveling out. The biggest one that I missed is what you mentioned about loans being backed my the government. Schools can confidently raise prices and expect that revenue from loans because it’s essentially guaranteed by the government. I agree with you that demand has driven the price up. It’s one of the few commodities that doesn’t sell more (e.g. increase enrollment) as demand rises. The only way to pay for the increased costs is through higher tuition prices. Schools are more concerned with having competitive acceptance rates than with the damage they’re doing to their “customers.” As long as people keep enrolling and the schools get their money, there’s no incentive to change the business model. Maybe if the schools had to provide the financing to the students, rather than banks, they’d be inclined to make it more affordable to ensure they get the money. I wonder if at some point the entire system will become unsustainable? Colleges are robbing this generation blind. The housing bubble burst, & the education one is coming next. We’re now the most educated generation ever but our real employment stats are pitiful at best. Meanwhile most people work in jobs they hate for peanut wages, and will remain buried in student loans. Only in a select few majors do graduates end up working in their their chosen fields. Doesn’t sound like living the dream. Not to say education isn’t important(it sure is). I believe you were a band director at a school system before you became MMM, and would probably agree a teachers salary isn’t anything to write home about, but you correctly pointed out some of the admin salaries are wacko! Not exactly sure what the solution is at this point. I’m interested to see how some new skills intensive training programs work out (like coding bootcamps) or maybe good old fashioned apprenticeship programs. They usually pay you to go to school, plus almost guaranteed employment when you finish! I tend to agree on the education bubble bursting. I have too many friends that can’t even make minimum payments on their student loans. A starting teacher’s salary is actually pretty decent, but the problem is that they don’t increase at a comparable rate to other industries. Teacher’s that have 20+ years experience don’t make a whole lot more than a new teacher! I’ve read a lot lately that trades like plumbing are in desperate need for young people. I think we will see a shift towards more apprenticeship programs that provide a great paying career with little to no debt. I don’t wan to discourage people from going to college BUT… after transferring from a junior college to a CSU I took one year and promptly dropped out. The school required I take three additional GE classes from the school ( just because) in order to graduate. By the way that would cost me at least an additional $3500 a whole semester of time even before I could start my regular course work. At the start of senior year I left because my spouse was going to law school and I couldn’t fathom dropping potentially another $10,000 on the sub-par education I’d received for SO much money. I want to bank roll my own education and I did for most of it! It wasn’t until I went to a four-year that I started hemorrhaging money. Still not sure if if I want to go back, too bitter. The higher education system in our country is horribly, horribly broken. I’ve long been disgusted by the salaries of college presidents, tenured professors who aren’t even teaching (flying around working on latest research papers while student faculty teach)…and don’t get me started on college sports and the costs that involves. Amenities are another thing….U of CO built a buffalo-shaped pool a few years ago. Talk about infuriating! My daughter goes to a private college and will assume thousands upon thousands of $ in debt if she decides to continue there. She will most likey do the wise thing and come back to CO to a state school next year. It’s still overpriced, but more manageable. We need to take a HUGE lesson from European higher education institutions and value the education over the billion-dollar INDUSTRY it is over here. It’s beyond pathetic.